Conservatives once said that Obamacare was too complicated to understand– now they’re arguing that its language was perfectly clear. 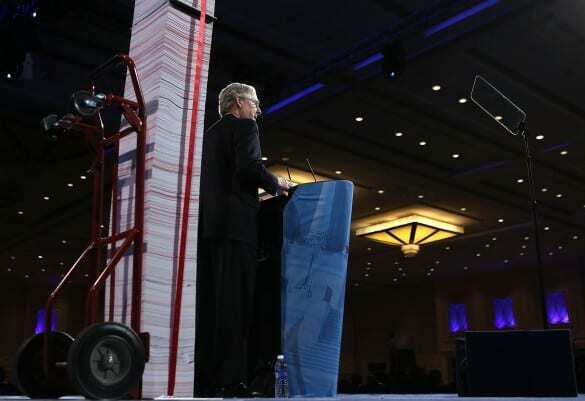 We’ve been hesitant to write much about the latest Obamacare lawsuits working their way through the courts– mostly because they seemed unlikely to go anywhere. The issue in these cases is whether certain Obamacare exchanges are allowed to provide the subsidies that make premiums affordable for most people. Unlike the big Supreme Court decision a couple years ago, these lawsuits don’t involve whether or not the law is constitutional; instead it has to do with interpreting what Congress meant in a section of the law that’s somewhat unclear, and the case that Congress intended not to provide the subsidies is very, very slim. Yet… here we are. Yesterday the D.C. Circuit Court of Appeals, in Halbig v. Burwell, ruled that Congress did in fact only mean for subsidies to go to certain exchanges. Then, just two hours later, the 4th Circuit Court ruled the exact opposite, saying the same thing as other lower courts: subsidies should be available in all 50 states. So what happens now? Probably still not much– the D.C. Court decision will almost certainly be overruled soon– but since it now looks like there’s a slight chance the case could make it before the Supreme Court, here’s an explainer on what’s at stake. The Affordable Care Act says that if a state chooses not to run its own insurance exchange, the federal government will run it for them. There are three key sections of the law here: Section 1311 lays out the rules states have to follow in setting up their own exchanges; Section 1321 allows the federal government to step in if a state chooses not to; and finally there’s Section 1401, which has the rules for who can get a subsidy to help pay for coverage. The problem is that in defining who’s eligible for subsidies, Section 1401 refers just to people enrolled “through an Exchange established by the State under section 1311”– there’s no mention of federally-run exchanges. The IRS has said even though the law doesn’t specifically mention the federally-run exchanges, Congress obviously meant for subsidies to be available everywhere, so it provided them on all the exchanges (the subsidies technically come in the form of a tax credit, that’s why the IRS is involved). But conservative scholars Michael Cannon and Jonathan Adler claim that Congress intentionally chose to keep federal exchanges from getting subsidies as sort of a punishment to coerce states into setting up their own. The IRS, they say, is acting illegally and without Congressional approval by providing these subsidies– thus the lawsuit. Other provisions of the statute reference an exchange “established by [a] State,” but really include the federal government. Another section of the law refers to a state-run exchange when everyone agrees that it means to include the federal government too. Also, the law actually requires every state to set up an exchange, and it refers to all the exchanges as having been established by states. So you can look at the statute as a whole and reasonably read it to extend the subsidies to residents of every state. 2. There’s no evidence that Congress intended to limit subsidies to only state-run exchanges. Congress definitely favored state-based exchanges, and expected that most states would want to run their own, and even provided a bunch of grant money to help cover the costs. It’s outlandish to think that Congress meant to threaten the states [so] it inserted the innocuous phrase “established by the State under 1311” into the complex calculation of the tax credit. Why? Because the supposed threat was so well-hidden that the states didn’t even notice it. No gun, no threat. 3. When Congressional intent is unclear, courts are supposed to defer to the agency implementing the law. At most you can argue that the subsidies thing is ambiguous and open to interpretation. Well, the Affordable Care Act explicitly gives the IRS the authority to interpret that section. Even if it didn’t, courts are supposed to defer to agencies’ interpretations anyways, “unless they are arbitrary, capricious, or manifestly contrary to the statute.” The IRS’s interpretation is obviously none of those. A recent report from Urban Institute researchers estimated that a ruling against the Obama administration could cause 7.3 million people—about 62 percent of the 11.8 million people expected to enroll in federally facilitated marketplaces by 2016—to lose out on $36.1 billion in insurance subsidies. 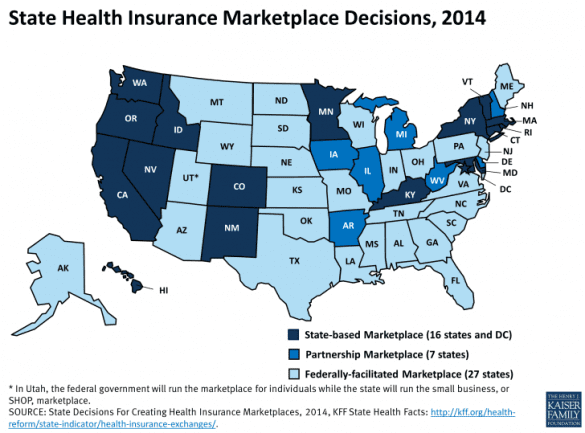 Unless your state is navy blue on this map, it would lose subsidies. Also Idaho and New Mexico (it’s an old map- they eventually went with healthcare.gov). Still, you can ignore scary headlines like “A Court Ruling Just Blew a Huge Hole in Obamacare” and “Today’s Court Decision Might Make Health Insurance Unaffordable in the Poorest States,” at least for now. In the U.S. Court of Appeals, cases are first reviewed by a panel of three judges– the two who decided Halbig were appointed by Republican presidents. However, you then can ask the full court to review the decision, and the D.C. Circuit Court right now has eleven judges: seven were appointed by Democrats, four by Republicans. Just hours after the Halbig decision, the Obama administration asked the whole bench to look at the case, and with such a large majority it will almost certainly be overturned. Also, remember that on the very same day another court upheld the subsidies, so eventually we’ll be looking at two decisions saying the subsidies can stay. It seems unlikely that the Supreme Court would deal such a major blow to Obamacare by restricting the subsidies– if it was gonna torpedo the new law, it probably would have done so in the ruling two years ago. (Goldstein, for his part, thinks the same majority that upheld Obamacare before will uphold the subsidies in this new case.) Still, you never know. What would happen if the Supreme Court did strike down the subsidies? Ideally Congress would just pass an amendment clarifying that the subsidies apply to state and federal exchanges. However, with this Congress, the minute you mention “ideally” and “passing” pretty much anything, you can forget it. There is a way, though, that states with federal exchanges could keep their subsidies, and without building entirely new exchanges. They could simply say they’re establishing an exchange, create some agency to manage it, and that agency would contract with healthcare.gov to operate it. Healthcare.gov is already operating their exchanges, so really nothing would change on the ground, but they’d keep getting subsidies. That said, leaving it up to some states to be proactive would be bad news– heck, the state of Indiana is also suing to get rid of the subsidies, and it’s hard to picture states like Texas saying yes to any part of Obamacare. So really– and this is why supporters of the law are a little nervous– the Supreme Court is the best hope for most people to keep their coverage.